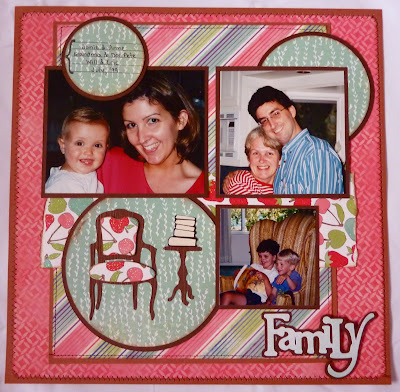 We had a drizzly Sunday here - a perfect day for some scrapbooking. 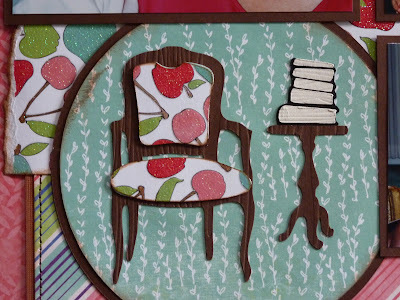 I recently saw a couple of Jana Eubank's videos on the Cricut Circle Blog. They are great for people like me, who scrapbook, but don't really know what they're doing. I kind of modeled this layout after one of hers, where she explained how to use the visual triangle rule and add texture and depth with some dimensional embellishments (sewing, in this case). I used my Gypsy to design this layout. The circles are from the Cricut Classic Font cartridge, but I didn't keep track of the sizes. 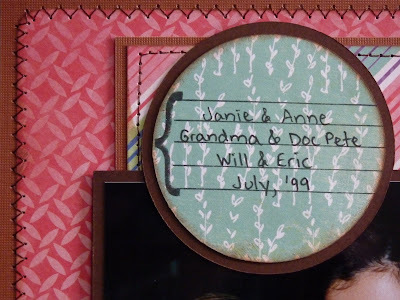 For my journaling, I used part of a stamp from My Creative Time's "My Journaling." I meant to make a rug to put under the chair and table, but I totally forgot. Oh, well. The chair is from French Manor, cut twice at 3.5" and layered. The table is cut at 2.5" from Kate's ABCs, and the books are cut at 1" from Locker Talk. All of those were run through the Cuttlebug with the Papertrey Ink Woodgrain Impression Plate. "Family" is cut at 2" from Gypsy Wanderings. Great layout. I sure do like how you added the cut of the chair to tie it in with the boys. Very nice layout great job! katie! just fabulous! love the stitching! Love your layout. I am always looking for new ideas, thanks for sharing yours. Wonderful little details and really fun to look at, especially the stitching. Great Layout Katie, I like the stitching you did on your page and the frame work around your pictures really add. I like to put mat backgrounds on my photos as well. WEll DONE! Wow! Love your layout. Your selection of paper is so elegant and soft looking. I love the chair and table. Your stitching is so PERFECT. Did you use a sewing machine? I got one several months ago but do not know how to use it. My husband said he will show me how to tread it. Let's see when lol. Just Beautiful! Winner of My Creative Time Blog Hop!